Help turn SRF’s vision into reality. For nearly a century, Self-Realization Fellowship has been the fortunate recipient of the generosity of its devoted members and friends. 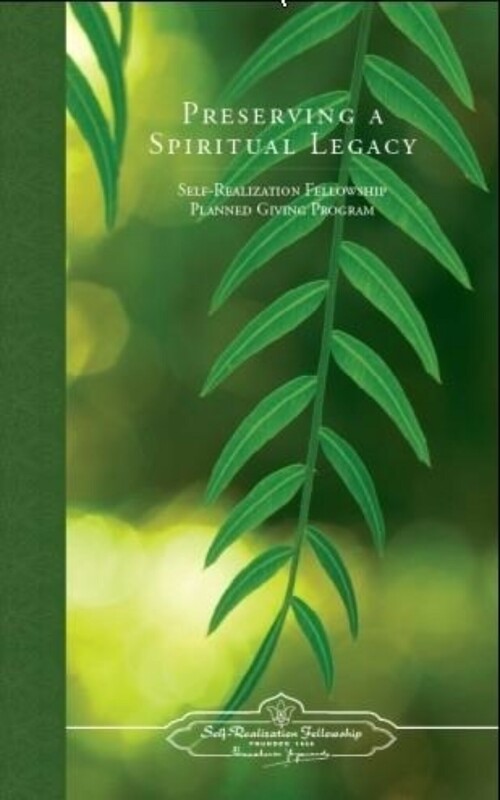 The society’s growth and its ability to carry on the worldwide spiritual work of its founder, Paramahansa Yogananda, are due in large part to these charitable bequests. Planned giving is a way to experience the joy that comes from participating in a worldwide sacred vision for the upliftment of humanity, by helping to ensure that the goals of Self-Realization Fellowship continue to be met. Planned giving also helps the donor to maximize the personal benefits of his or her charitable gifts (such as tax savings, increased income, and sound estate planning), and allows for the contribution of gifts that otherwise might have been thought not possible. We invite you to review the options available and determine the ways in which your contribution can make a difference. It is through your support that Self-Realization Fellowship will be able to continue the legacy of Paramahansa Yogananda and bring new hope and inspiration to receptive hearts through his sacred teachings. May God bless you for helping us to serve all who are striving for a closer relationship with Him, and to contribute to greater peace, understanding, and unity among the human family.